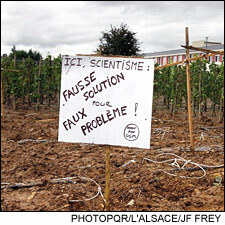 PhotoPQR/L'ALSACE/JF FREY Activists destroyed a vineyard. The sign reads, "Scientism: False solution for fake problems." “Reapers” target genetically modified vines; Researchers try to educate wary French public about the benefits of research. The attack came at dawn and was swift. On Aug. 15, around 70 members of a French environmentalist group known as Les Faucheurs Volontaires—”the Voluntary Reapers”—infiltrated an experimental vineyard in Colmar, France, digging up and hacking apart some 70 vines with genetically-modified (GM) rootstocks, grown by the French National Institute for Agronomic Research (INRA). In the 20 minutes it took police to arrive, the Faucheurs inflicted about 1.2 million euros ($1.56 million) worth of damage to the taxpayer-funded research project, leaving an empty patch of dirt.